We all know that actress Priyanka Chopra and singer Nick Jonas tied the knot in December last year at Jodhpur’s Umaid Bhawan Palace and that the wedding is still the talk of the town with a good number of unseen pictures popping up now and again. 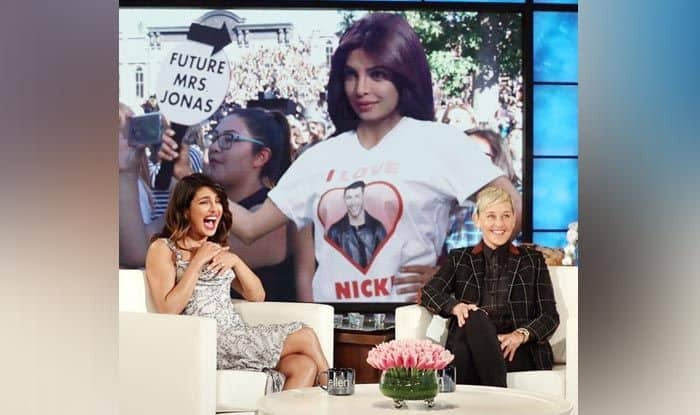 Well, it seems to have happened again, and this time on The Ellen DeGeneres Show where the show’s host, Ellen, decided to come up with a vintage photo of Priyanka rooting for Nick. Apart from the photograph, Ellen is also believed to have told Priyanka on the show that even though she was not invited to the wedding, she still had a gift for the couple. The gift in question was an enlarged photo of Nick sitting with Ellen on the couch while Priyanka was seen having a shot to the side. Check the video that was shared by a fan. Ellen also shared another video in which Priyanka is seen talking about how she and Nick first connected. Priyanka was on the show to promote upcoming 2019 American-Australian satirical fantasy comedy film Isn’t It Romantic. The film, which is directed by Todd Strauss-Schulson and written by Erin Cardillo, Dana Fox, and Katie Silberman stars Rebel Wilson, Liam Hemsworth, Adam DeVine, along with Priyanka.